The Faulring family came to America in two separate groups. First, Peter and Elizabeth Faurling made the journey in 1852, and then the remainder of the family followed in 1853/54. To legally emigrate the family needed to obtain permission from the Duchy of Coburg-Gotha, which largely hinged on completion of an obligatory two-year military service, for men, and settlement of any outstanding debts. This process, followed by most would be emigrants from a German state, is typified by experience of Faulring family. It is important to note that families came to America, like the Faulring family, needed a significant amount of money to pay travel expenses. Further, they would need some money to establish themselves after they arrived. Papers found in the State Archive at Coburg show that Peter and Elizabeth applied to the Duchy of Coburg for permission to leave for America on May 29, 185262. Their application resulted in publication on June 9th of an announcement in the government newspaper shown below. One Johann Peter Faulring from Moggenbrunn intends, with his sister Margarethe Elisabethe Faulring from the same place, to travel to America soon, and possible claims should be brought here within 8 days. Peter and Elizabeth were approved to emigrate on June 22, 185262. The image at the right shows the final entry in the official record pertaining to their application. This entry appears to be a copy of the travel permit given to Peter and Elizabeth. The two columns on the left are a description of their appearance and the column on far right is the authorization to emigrate, part of which could not be copied due to the tight binding. Peter and Elizabeth left for America shortly after receiving their permit, probably in early July. They likely traveled by train to Bremen, their port of departure, which might take a few days. They sailed from Bremen on July 12, 185263, aboard the sailing ship Richard Anderson, and arrived at the Port of New York on August 11, 185263, along with 202 other passengers. In 1852, there were no immigration facilities in New York, so passengers were deposited on the pier to fend for themselves. Arriving passengers would be accosted by a variety of vendors, offering food, lodging and transportation, some legitimate, others out to make a fast buck. From New York City, Peter and Elizabeth would have traveled by boat up the Hudson to Albany and by train across the State to Buffalo. Why and how they chose to settle in the Town of Concord, Erie County is unknown. However, it is likely they knew someone who had already settled there and had some prior information which influenced their choice. Johann Friedrich Faulring also had to apply to the Ducal Government for permission to emigrate. In his case, however, the process was complicated because Johann Friedrich was a tenant farmer (bestander). This meant he had obligations to the Duchy of Corburg from whom he rented land. Thus, in the Spring of 1853, he requested release from these obligations. 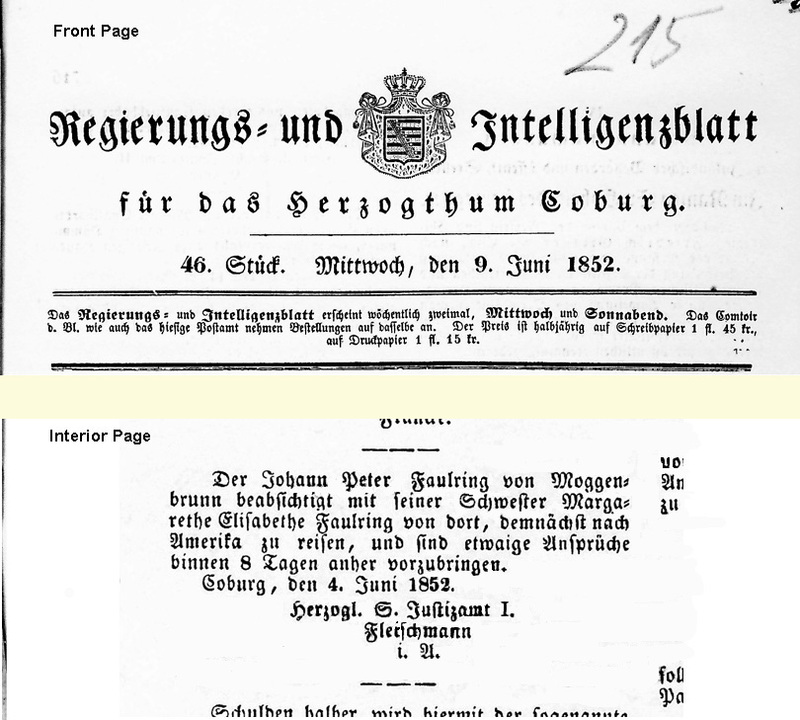 The image at the left show the last section of a contract issued on April 4, 1853, by the Immediate-Commssion for Domain-Discharge (Immediat-Commission für Domainial-Ablösungen). Note Johann Friedrich's signature on the bottom. The contract included a Table outlining the various pieces of land (six in total) rented to Friedrich and amount of rent due through the end of 1853. The total came to 38 Guilder 44¾ Franks. Upon payment of this amount, Friedrich would be discharged from any future obligation to the Duchy. The contract was certified by the Commission on April 22, 1853. 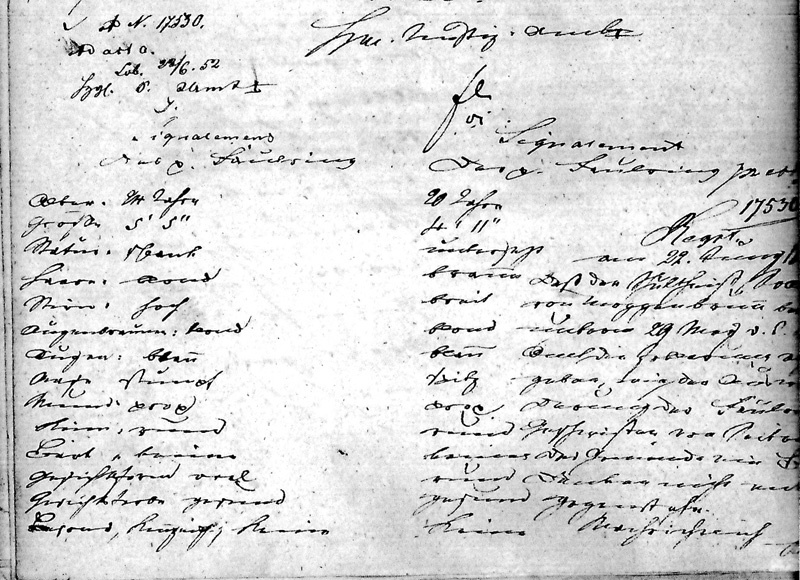 On May 2, 1853, the Ducal Chamber and Rent Office implemented the discharge indicating that Friedrich had paid the required amount. Ship Herschel, (Hamb) Meyer, Hamburg 1 ds., mdse. and 264 passengers to Schmidt & Balchen. Jan. 3, lat. 29 30, lon. 67 40 +chr. -------- of Philadelphia, with both masts gone, had jury masts rigged and was lumber leaded. The H has experienced heavy weather; lost starboard bulwarks, two jibs &c.
Clearly, crossing the Atlantic in the middle of Winter was not easy. After being dropped on the docks of New York City, the Faulring family made their way to Western New York, most likely be boat to Albany and then train to Buffalo. Surely, they were met by Peter and Elizabeth in Buffalo, who would have accompanied them on the final leg of their journey by wagon.